Two girls are forced into the woods at gunpoint. One runs for her life. One is left behind…. Twenty-eight years later, Charlie has followed in her father’s footsteps to become a lawyer herself – the ideal good daughter. But when violence comes to Pikeville again – and a shocking tragedy leaves the whole town traumatized – Charlie is plunged into a nightmare. Not only is she the first witness on the scene, but it’s a case that unleashes the terrible memories she’s spent so long trying to suppress. Because the shocking truth about the crime that destroyed her family nearly 30 years ago won’t stay buried forever. 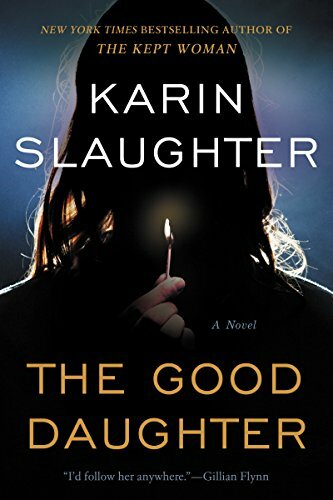 With The Good Daughter, Karin Slaughter once again proves her tremendous prowess at delivering a page-turning, tautly written thriller. In characteristic Slaughter style, she pulls no punches with this standalone story that’s both chillingly brutal and emotionally delicate. A story in which she delves deep into one family’s psyche to explore the aftershocks of a horrible crime. Twenty-eight years ago, two young sisters, Sam and Charlie, were forced into the woods by two men in face masks. They’d already witnessed harrowing, unforgettable things that debauched their family home forever, their mother’s blood staining the kitchen floor as they were led out at gunpoint. Daughters of the town’s most notorious and controversial attorney, Sam and Charlie had been at the wrong place at the wrong time. Now, like her father, Charlie works as a defense attorney. And her life—a journey of heartache and pain sustained—takes another wrong turn when she witnesses a terrible crime, one which sparks outrage and fury amongst the town. As the case unravels, her own sanity fractures further, extricating memories of a night she’s tried to bury. And before it’s all over, she’ll have to face her past head on, unveiling a truth she’s hidden for far too long. Tension ratchets consistently, taking surprising turns in a tale fraught with emotion, grief and a bevy of secrets. As in her other novels, Slaughter’s multilayered story is punctuated by flawed, complex characters who you grow to care for, making plot twists all the more impactful. Chilling, but with a lot of heart, this is a thriller you shouldn’t miss.